Driving is something you are going to learn once, so you want to go with a professional company. What sets DriveWise apart from other driving schools is our driving simulator and highly professional instructors. Most of us are hands on learners and by starting to drive in the classroom it provides better understanding of why we scan, brake and maneuver a car the way we do. Our students will experience adverse weather, mechanical failures, traffic, and unpredictable animals as part of their in-class training. We provide two in-class instructors for better teacher to student ratio. Using our famous ‘clickers’, (CPS hand held remotes) each student answer without fear of making a mistake in front of others. All our in-car instructors are passionate about driving safely and have been professionally trained as driving instructors in the province of Ontario. Each in-car lesson is private. Whether you are looking to take a full course, need road test prep or just a lesson or two we can help prepare you for the road ahead. Driving is something you are going to learn once, so you want to go with a professional company. 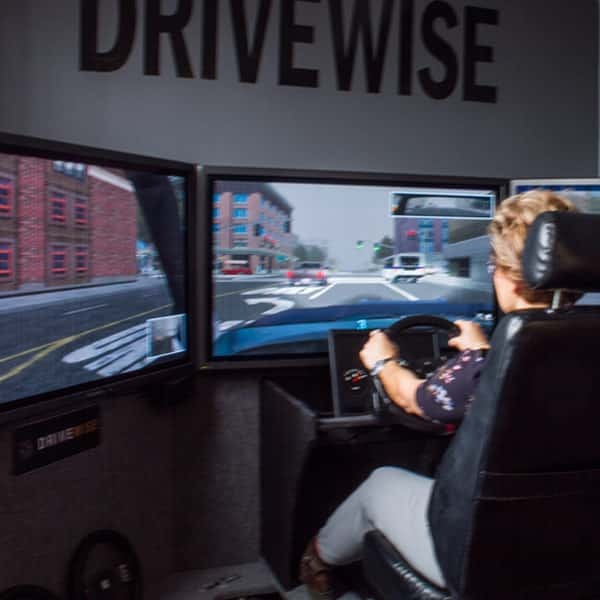 What sets DriveWise apart from other driving schools is our driving simulator and highly professional instructors. Most of us are hands on learners and by starting to drive in the classroom it provides better understanding of why we scan, brake and maneuver a car the way we do. Our students will experience adverse weather, mechanical failures, traffic, and unpredictable animals as part of their in-class training. We provide two in-class instructors for better teacher to student ratio. Using our famous ‘clickers’, (CPS hand held remotes) each student answer without fear of making a mistake in front of others. All our in-car instructors are passionate about driving safely and have been professionally trained as driving instructors in the province of Ontario. Each in-car lesson is private. Whether you are looking to take a full course, need road test prep or just a lesson or two we can help prepare you for the road ahead.